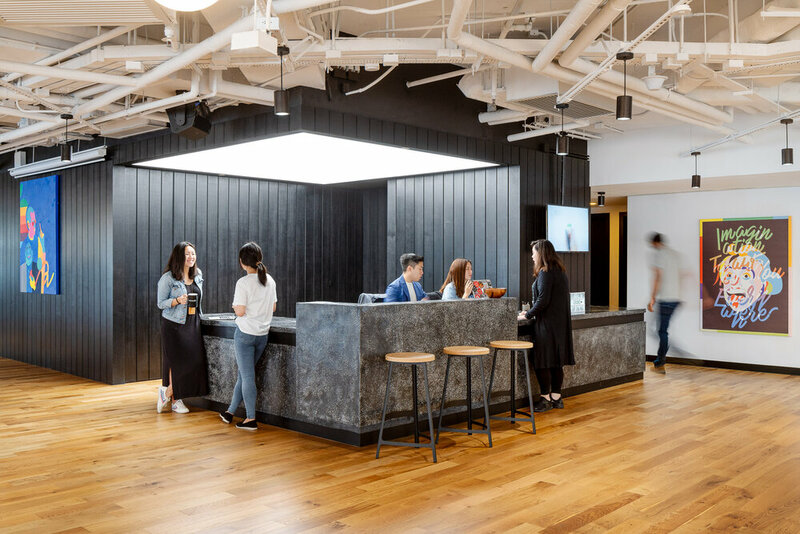 Headquartered in New-York with 50 office locations around the world, WeWork has now transformed Shanghai buildings into exciting shared workspaces. As the flagship location for China, WeWork Weihai Road resides in a historical building originally designed by British firm Spence Robinson & Partners in the 1930s. The designer took inspiration from "The Grand Budapest Hotel" and added pink, blue and green into the original structure, combining lively modern design into the historical architecture. The historic building has now transformed into a modern workspace, attracting aspiring entrepreneurs, designers and emerging businesses large and small. WeWork East Yanan Road brings modern Shanghai office space to People's Square. Adjacent to a neighborhood filled with northwestern food restaurants, the space was influenced by the Silk Road in its design. A hand-painted mural inspired by the ornate patterns and vibrant colors of silk road can be seen in the lounge area. In just three months, WeWork transformed the ninth floor of the Standard Chartered Tower in Hong Kong into a space that inspires creativity and collaboration. 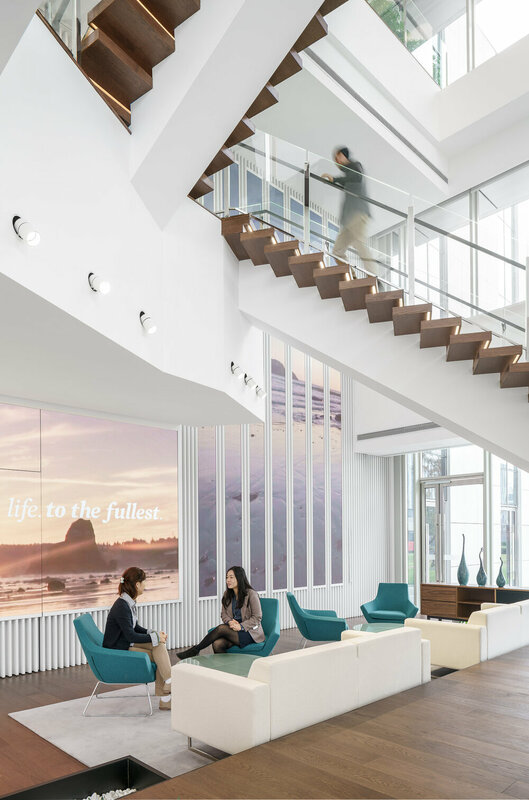 For SC Ventures to be an agent of change within the company, they needed a bright, modern space that would inspire innovation and creativity, foster collaboration, and increase team efficiency—as soon as possible. The eXellerator Lab includes flexible classrooms, different types of meeting rooms, and even a large lounge to accommodate a wide range of events and day-to-day workshops. The design incorporates Standard Chartered’s brand colors, as well as nods to local Hong Kong culture. Standard Chartered has taken full advantage of the new space, hosting events and working cross-functionally to develop new products. From revamping their call centers to developing a web chatbot and relaunching their mobile app, the eXellerator Lab is already generating returns for Standard Chartered. Their office in Shanghai is located in one of the two IAPM office towers in the center of Shanghai and enjoys spectacular views of the city. Headquartered in Shanghai since 2002, they have grown into multi-cultural firm of 60 people working on a global scale with projects in Asia, the Middle East, Europe and North America. Kokaistudios partners with their clients to collaboratively develop innovative & ground breaking projects in diverse fields of design. Primarily focused on developing cultural, corporate, commercial, hospitality & retail projects, the firm has also worked extensively on urban regeneration projects involving the requalification of heritage locations. Kokaistudios aims to develop projects that add positively to the built environment and social fabric of the cities and countries in which they are located. The Richemont retail academy has re-opened within the grounds of the Huaihailu 796 complex; the UNESCO award winning complex designed by Kokaistudios that opened in 2008. As the central retail training lab for all of the brands owned by the Compagnie Financiere Richemont; the world's second largest luxury conglomerate; Kokaistudios developed an innovative and welcoming interior design concept as a continuation of our long cooperation with Richemont that extends from architectural design to the development of global retail concepts and roll-outs. The project occupies the 2nd floor of the office building that lies to the Northof the historic Twin Villas that house the Maison Vacheron Constantin, the Alfred Dunhill Home and the Kee Club. In accordance with Richemont Group's value, the design of the retail academy emphasizes upon growing synergies between multiple brands and passing on common message of the group. The layout of the two-story training academy was essentially composed of five parts, including two reception and waiting areason each floor, two corridor and lounge areas on each floor, office on the second floor, pantry & computer area and training class rooms on each floor. The rectangular shaped floor plate is mainly defined by patterned glass partition and signature wood panels. The second floor gives forth instant youthfulness and vitality. Fun Spun Seats from Magis and a communal table are placed in the center of the lounge area, matching with vivid grass green rug. On each side of the central area, blue high-back sofas by Buzzi Space are installed, which can function as informal meeting space. People can easily come together and share information with privacy. The third floor is elegant in style with innovative contemporary furniture. In the lounge area, the designer mixed Ro chair from Fritz Hansen, Alcove sofa from Vitra and fabric surfaced stools to create a flexible meeting, reading and relaxation space. Training classrooms are located beyond the glass partition. The translucent dotted glass adds vibrancy and provides privacy. Each classroom is separated by removable walls which are sound proof. The removable walls also gives the whole space flexibility for other events. Atthe end of the lounge, there are computer area and a long white communal table serving as work station or dining area. Mailman Group, a Shanghai-based technology and social media agency, recently moved to a new office on Fuxing Road. The space was designed by New Zealand architect Hannnah Churchill of hcreates. 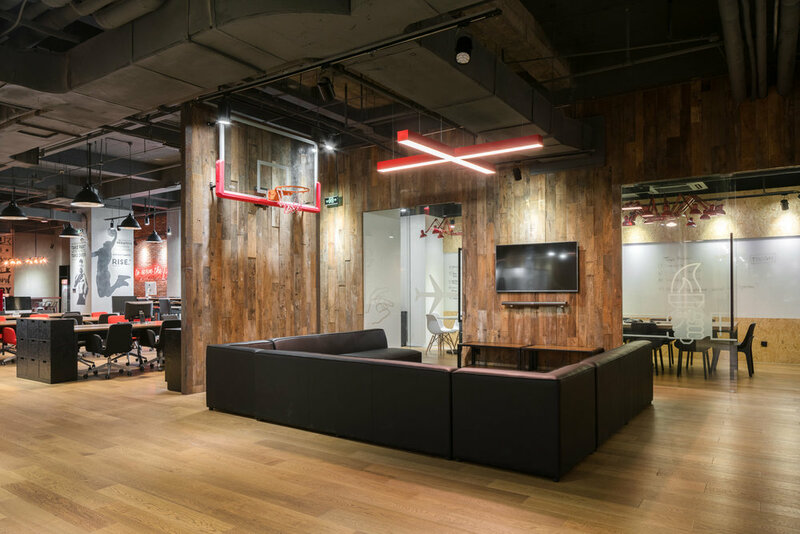 Playing off the creative culture of this agency, the office combines sport and travel media themes to make a vibrant and inspiring working space. Multi-use rooms serve a dual purpose as both meeting and breakout rooms. Flexible working spaces allow for hot desking and a variety of working preferences. Simple concreate pillars provide an ideal background for wall art that speaks to the agency's ethos. A kitchen area occupies a corner of the open floor. Neon lights and Edison bulbs create a moody atmosphere for employees to relax and recharge at the bar and dining tables. They even have beers on tap! The main focus of the office design is to inspire creativity of the Mailman team. 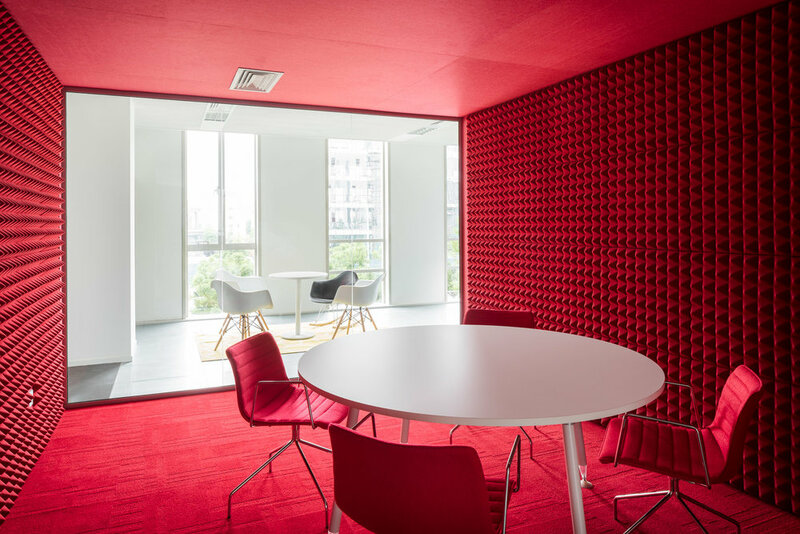 The Shanghai office of Mindshare, a global media and marketing services company, was designed by PDM International with artwork by The Orangeblowfish. The contrasting elements that make up the space, light and dark, colorful and subdued, serve to create an eye-catching design. The sitting area near the front entrance is styled with modern furniture. The open stairwell goes up vertically for six floors, a remarkable engineering achievement. Sitting areas alongside the floor-to-ceiling windows; natural light brightens up the space together with chic light fixtures. Grey brick walls help to define a communal space where employees can sit for a break or to enjoy a meal. A comic book wall that mixes superhero stories with current trends in social media brings a sense of fun to the working areas. Guotai Junan Securities Co., Ltd. (GTJA) is one of the largest investment banks and securities companies in China. During 2004–2011, the company has been top-ranked in World Brand Lab-China's 500 Most Valuable Chinese Securities Brands. While in 2008–2012, it has obtained Class A AA-level according to the securities classification of the China Securities Regulatory Commission for five consecutive years. Their new headquarter in Jingan District was designed by BNJN, a multi-faceted da multi-faceted design studio tailoring distinctive workplace solutions for corporate offices and headquarters.esign studio tailoring distinctive workplace solutions for corporate offices and headquarters.